Plotting the family tree of IBM's "mainframe" (or relatively large-scale) computers might not be as complicated or vast a task as charting the multi-century evolution of, say, the Smith or Lee families but it nevertheless requires far more than a simple linear diagram. Back around 1964, in what were still the formative years of computers, an IBM artist attempted to draw such a chart, beginning with the IBM 701 of 1952 and its follow-ons, for just a 12-year period. 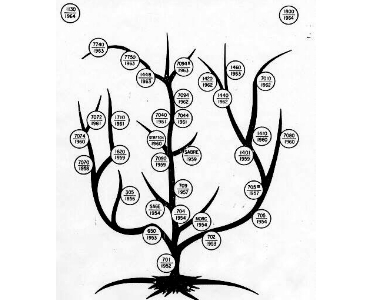 Although that primitive diagram predated the legendary System/360 and its many offshoots, the IBM computer family tree drawn nearly 40 years ago shows 33 members in three main branches. Today, such a tree would be far too tall and wide to fit on a single page. That's because over the course of the late 20th century, IBM developed and introduced a substantial number of "large" computers, processors and data processing systems. Some of these machines were unique one-offs with no further "offspring," while dozens of others were the initial members of a major product series or family. the first large-scale electronic computer manufactured in quantity -- the IBM 701 of 1952 -- which was IBM's first commercially available scientific computer. the innovative IBM 305 Random Access Memory Accounting Machine (RAMAC) of 1956, which used a magnetic disk memory unit to make possible "in-line data processing" (in which all affected records were adjusted immediately after a transaction occurred). the Stretch supercomputer (IBM 7030) delivered in 1961 -- 200 times faster than the IBM 701, 40 times faster than the IBM 709 and seven times faster than the IBM 7090.